With the political turmoil revolving around President Trump’s decisions on climate science since he entered the White House, it has been very easy to lose sight of the bigger picture. After the recent withdrawal of the US from the Paris Agreement and the various steps taken to defund and discourage federally funded climate research, it is tempting to conclude that climate change denial is in vogue. Fortunately for human beings, this is not correct, despite the political climate. While American political culture is contentiously divided about climate change, there is surprising consensus behind action on climate change. If any one word could describe American society’s opinion about climate science, it would have to be division. Society has been divided sharply on this issue since its rise to cultural prominence in the 1980s. This division has been fairly clear cut on party lines; with the Republican party opposing and the Democratic party supporting the scientific consensus that the climate is changing due to human action. Special interests have played a strong role in shaping the debate as well, with the fossil fuel industry funding the elections of politicians and creating PR campaigns aimed at curtailing climate change research. It has been estimated that over $500 million has been spent from 2003-2010 to this cause (1). For individuals, however, this division is, for the most, part centered around key “buzzwords.” Some special interest groups are opposed to the entire concept of climate science as they believe it affects their business interests. However, society in general is not opposed to the concept but rather words used to describe it. For instance, while only a small percentage of Republicans would agree with the statement that “humans are to blame for climate change” or that a “carbon tax is a policy that should be implemented to curtail climate change,” most Republicans agree that “climate change is something they are personally concerned with”. These specific buzzwords “human caused” and “carbon tax” have been tainted by the political debate, but yet even Republicans are concerned with and interested in climate change. To further illustrate the wide support for action, a recent Yale Research Study found that “7 out of 10 Americans”(2) were strongly opposed to the US withdrawal from the Paris Agreement. The study cited a broad desire to participate in global climate protection efforts. Another recent study by Pew Research corroborates Yale’s conclusions. It found that over 74% of Americans expressed concern about climate change (3). In addition, in the same study, over 75% of Americans expressed a desire to personally help the climate in their everyday life. One of the biggest points of popular agreement is in renewable energy. Most Americans see solar and wind power as technologies with immense potential and support their use and development. Not only are they seen as potentially solving the problem of climate change outright, clean technology is perceived as massively beneficial health and wealth of society. Many business owners as well see clean technology as able to reduce energy costs and improve the quality of their services. Pioneers like Tesla have demonstrated that clean technology can have massive popular appeal, and business giants are taking note. This coalesces into an interesting picture: yes, the political debate about climate change is contentious. However, Americans as a whole are eager to take action of some kind on the climate. Being climate friendly is a selling point with mass-appeal, and being environmentally conscious is absolutely necessary for long term growth. 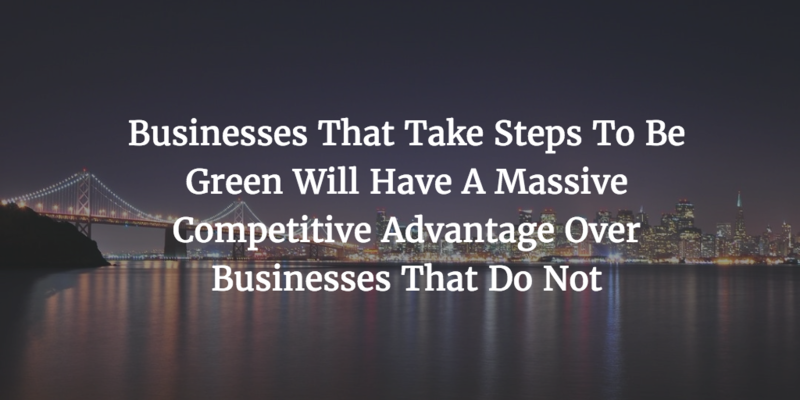 Moving forward, businesses that take steps to be green will have a massive competitive advantage over businesses that do not. Clean technology is the future. But if you’re reading this here – you knew that, right?